The French department of industry had a construction competition in 1978 which was won by three gentlemen by the names of Louis Boccardo, Dominique Favario and Thierry Grange, hence BFG. The idea was to put a car engine in a motorbike frame and was manageable enough to actually make it into production. According to certain sources it was part of the company that had been working with the manufacture of the Concorde that got the assignment. According to the instruction book the responsibility was in the hands of the moped- and bike manufacturer Motobécane, at least towards the end when the BFG factory had financial trouble. The company SOMA designed the gear box and the rear transmission with its specific castings. The engine, originated from the GSA CITROËN car, was re-fitted with new accessories, improving the look and the motorbike functionalities : New tappets covers in moulded alloy, traditional ignition and fuel pump were replaced by an electronic ignition and an electric fuel pump dipped into the fuel tank made in rotomoulded plastic. The equipment of a BFG are made for grand touring ; shaft driven, full fairing offering a good protection to the pilot, « Jaeger » dashboard (coming from the RENAULT 5 Alpine car) showing the neutral gear, the red zone, aso. The engine of the BFG perfectly answers the grand touring use with its high torque available even at low rpm. The BFG was produced in La Ravoire, near Chambery, in the french Alps. About 400 units were manufactured from 1982 to the end of 1983. 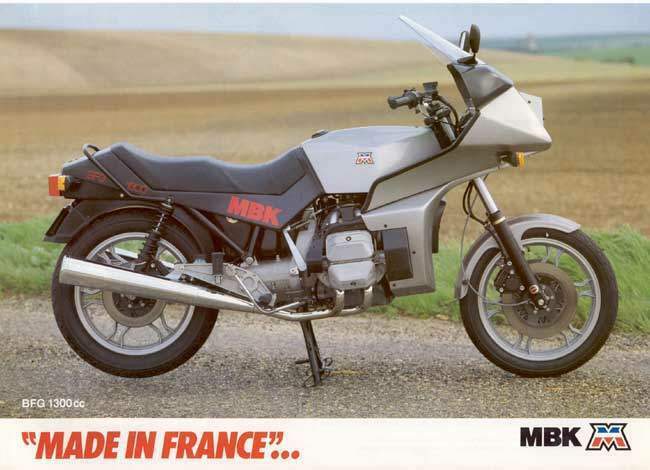 In 1984, MBK took over and transfered the production to Saint Quentin in the North of France. Between 1984 and 1988, only 150 machines were produced. 1988 was the end of factory made machines. 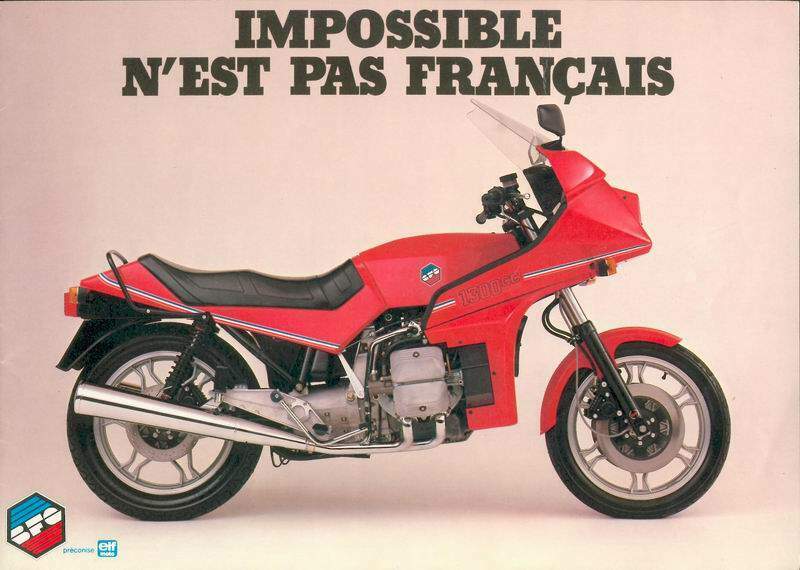 In 1989, the spare parts stock was sold to « Atelier Précision » in the North of France. Précision used to manufacture classic sidecars and assembled a few couples of bikes. They stopped all activities in 1996. In 1996, the stock of spare parts from Précision was bought by the BFG motoclub. The club is now responsible for supplying all needed parts, but the production of new bikes is definitively over. The engine is a 1 299 cm3 GSA engine where the modifications were kept to a minimum. Among other things the fuel pump has been replaced with an electric one and the distributor has been replaced with an electronic ignition system. The rocker covers are made of light alloy and the exhaust system is of course replaced with chromed pipes and silencer. The clutch is modified to make it manoeuverable by hand. The gear box is specially made, as is the tubular frame. The gearbox has 5 gears with neutral between 1st and 2nd gear, and integrated with the cardan. An odd detail is the use of straight gears in the gearbox. The brakes and wheels are from Brembo, like the Moto Guzzi, and the silencers are also Italian. On the electrical side there are more car parts. The headlamp is from a Renault R16 and the instrumentation from an Renault 5 TS. The generator and starter engine are from the GSA. Covers, tank and saddle are specially made. The tank isn't placed in its ordinary place, where the air filter, battery and relays are mounted, instead it's placed under the saddle (in the same way as the Honda Gold wing). In the lower part of the covering there's the air intake, and the fan on the motor has been retained which means there's ample cooling even when driving slowly or standing still. It's very long and wide, like a large BMW, but a few sizes bigger. The wheel base is 20 cms longer on the BFG.